This NTA home-page is a "backbone" connecting you to all sorts of Triton info and goodies. For example, one link takes you to Ray Alsup's Maintenance, Improvements and Restoration web pages. Ray's loaded this area with tips, ideas and PICTURES(!!!) collected from Triton owners all over North America. There's even a link to one of Bill Bell's classic "Improvement Bulletins" which is entirely on-line. The Reading Room has an ever growing collection of articles on Triton cruises, Triton sailing, and Triton sailors (be sure to take a look at one of our favorites, "Ralph Beauregard and Rascal II"). Finally, we've set up a Triton electronic "discussion group" which has rapidly blossomed into a thriving community of Triton owners. You can find out what's been going on in this group by checking out the archives via a link on the "Triton e-Mailing list/Discussion Group" page. You can join here, too. It's free. Consider joining this Triton electronic discussion group; it is probably the best vehicle we have for making the NTA a vibrant and truly beneficial organization. The philosphy of the NTA page is that it's a "backbone". Ultimately, this means that it has links to webpages created and maintained by a variety of folks who are really interested in the topics. Right now "Cruising" and "Sailing Faster" and links to regional fleets such as Chesapeake, New England and Long Island Sound are needed. 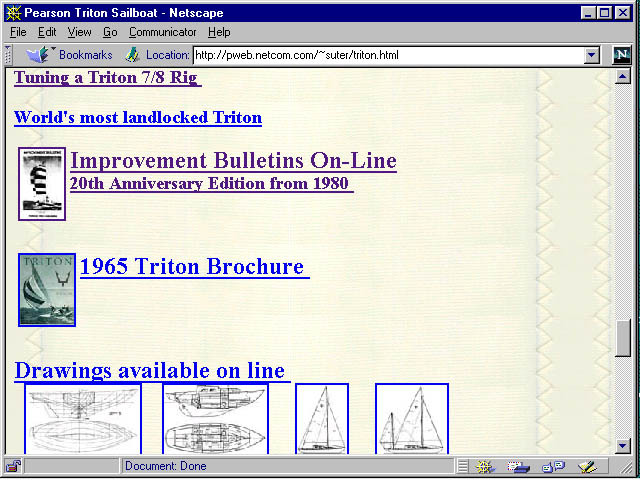 If you think you'd be interested in setting up some sort of Triton related webpage please give me (Larry Suter) an email at suter@ix.netcom.com . Not only is a this a good way to meet a variety of Triton (and other boat) sailors, it's a rather gratifying pastime. Evict some teenager who's overstaying his/her time limit on the computers (but be nice; you may have to ask for help, later). How to "navigate" down and up the page and how to "click on the links" (this takes you to some different webpage and is the key element that makes the web come alive). How to go "Back" to a previous page from the one you've wandered to by "clicking on links". This keeps you from getting too "lost in cyberspace". How to check-out the Triton Discussion Group (it's a "link"). Give it a try. It's fun and warmer and drier than sailing. And if you've got something you'd like to see on the pages, send us some e-mail. You can do it from the NTA page. So, what good is this web-stuff, anyway? "I'd like to ask folks what they know about having water in the keel. I have had my triton through 1 season. When it was hauled out last fall I saw cracking in the bottom paint that corresponded to cracking in the gelcoat. So I started to sand, and sand, and sand, when I had the moisture content measured. We found "dangerous " (20%) levels of water in the keel alongside where the rudder attaches and along the bottom of the hull. When I asked Interlux, they said if I barrier coated over it wet, it would produce osmotic blisters. Others have told me that it could take anywhere from 2 months to 2 years to dry. Anyone got any advice for me?" The Triton was molded in a one piece mold which made it extremely difficult to lay-up the section just forward of the rudder. Therefore, we made a separate piece which extended from the back end of the keel to a point below the propellor aperture. This piece was filled with urethane foam and bonded with epoxy to the bottom of the hull. Sometimes, when the boats were hauled they were set on timbers where the weight of the hull was borne by this aft section and not on the bottom of the lead keel. This caused some minor cracking and allowed some penetration of water. Some owners drilled a small hole in the forward part of this section to allow water to drain when hauled and prevent freezing. This section filled the area and provided a support for the bottom of the rudder. Otherwise, it is not a necessary part of the hull structure. In the Ariel the heel was molded as part of the hull and foam was subsequently poured into the back of the hull to fill this deep narrow area. It was then glassed over to prevent water from getting at the foam and to allow for easier cleaning. If you think there is water down in the back of the keel, I would drill a hole at the bottom below the foamed area,drain it, reseal it, and then redo the glass job on the interior over the foam.